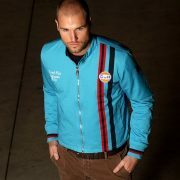 Clothing for the Racing Inspired - Gulf - BRM Spirit of Racing is the official distributor of GULF merchandise in Australia. We hope you have a pleasant journey reliving the legendary days of Le Mans during the 60’s and 70’s with our exclusive collection. Spirit of Racing range includes Caps, Shoes & Scarves. Race Helmets, Bags & Sunglasses. Jackets & T-Shirts. BRM Watches and Gulf Classic Oil. Steve Mcqueen "Racing is Life"
Spirit of Racing is the official distributor of GULF merchandise in Australia. We hope you have a pleasant journey reliving the legendary days of Le Mans during the 60’s and 70’s with our exclusive collection. Spirit of Racing range includes Caps, Shoes & Scarves. Race Helmets, Bags & Sunglasses. Jackets & T-Shirts. BRM Watches and Gulf Classic Oil. Spirit of racing is proud to offer to the passionate racing aficionado a premium clothing range, made by the finest threads from an authentic collection that is officially licensed and inspired from racetracks throughout Europe like Le Mans, SPA, Monaco and the Nurburgring of yesteryear.